Anyone who has ever served in the United States military remembers the moment they met their drill instructors. The brand-new U.S. Marine Corps recruits in this video are being recorded during the initial moments of boot camp at the depot in San Diego, California. 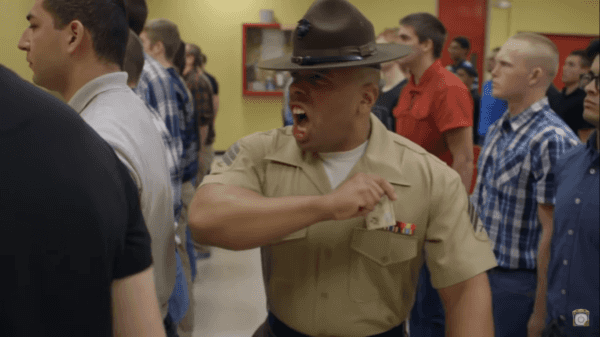 Drill instructors bark out orders and warn that they had better get done and quickly, as seen in the video. The recruits’ introduction to the USMC is intense. A simple task like pulling a string on a bag can become difficult when there is an angry drill instructor screaming in one’s face. It doesn’t help that shouted instructions can be difficult to decipher. For those who have been through it, it’s impossible to forget the first time of heading to the barber to get their head completely shaven. Like an assembly line, the recruits are filed into barbers’ chairs and their heads shaven in seconds. This video gives an in-depth look into what life is like in the military, and it might help potential recruits see what they would be getting themselves into if they were to join. While some may watch the video and think that environment isn’t for them, the final result after becoming a part of the U.S. Marine Corps makes it worth the challenge. As the video indicates, the success of the Marine depends on teamwork. “From now on you will eat, sleep and drink teamwork,” the drill instructor commands. The recruits in the video are young recruits, but in a short time, they will be well rounded and respected men who are part of one of the oldest military branches in the country. They will be men who are willing to die for a country that doesn’t always show them honor and some of them will indeed lose their lives during the course of their service. The looks on these young men’s faces is nothing short of fear, but it is a look that will soon be replaced with pride. The drill instructors are tough and they are consistent but it has been proven time and time again that the Marine Corps is the force to be reckoned with and this is how Marines have been molded for over 200 years.